Canadian State of the Space Sector 2018 report. Credit: Canadian Space Agency. According to the 2018 State of the Canadian Space Sector report, 2017 revenues totalled $5.6B, a $65M increase year-over-year which translates into 1.2% growth. It should be noted that the numbers in the report are unadjusted for inflation. According to the Bank of Canada, inflation in 2017 was 1.61%. The Canadian Space Agency characterizes the State of the Market as stable. While this is true, it comes at time when global space revenue grew by 16.5% in 2017 over the previous year according to 2018 Space Report produced by the Space Foundation. Clearly Canada did not take part in the gains in the marketplace. 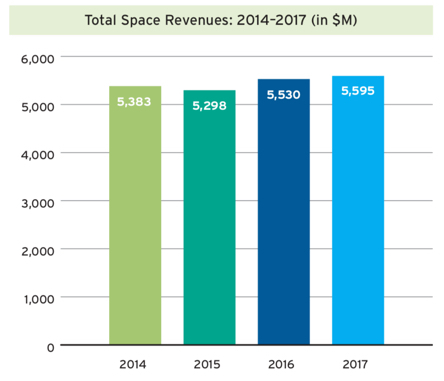 Canadian State of the Space Sector Total Space Revenues: 2014–2017. Credit: Canadian Space Agency. In 2017, the space sector contributed $2.3B to Canada’s GDP and supported a total of 21,828 jobs. Total revenues in the Canadian space sector reached $5.6B. The Canadian space workforce totalled 9,942 space-related full-time equivalents (FTEs), of which 43% were highly qualified personnel (HQP). Business Expenditures on R&D (BERD) reached $363M, a 43% increase from the previous year. Canadian space companies derived $330M in revenues through the commercialization of externally funded R&D projects, a significant growth from 2016. Space sector organizations reported a total of 203 inventions and 118 patents. Canada’s top 30 space organizations accounted for 97% space revenues, 81% of space employment, 88% of BERD (Business Expenditures on R&D), 65% of patents, but only 32% of inventions. That businesses are spending more on R&D is a positive sign as is commercialization of projects that government initially funded. BERD (Business Expenditures on R&D) expanded to $363M in 2017, a 43% increase from the previous year. R&D intensity for Manufacturing in the Space Sector was 10 times higher than the average for manufacturing in Canada. Canadian space companies derived $330M in revenues through the commercialization of externally funded R&D projects, a 169% growth from 2016. 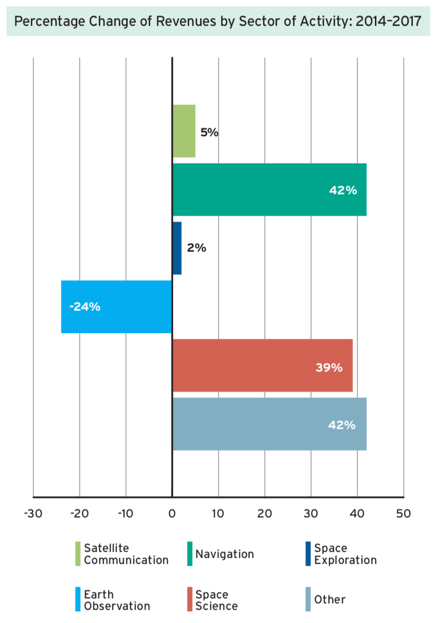 Proportion of Business Expenditures on R&D. Credit: Canadian Space Agency. Not that anyone should be surprised, but the trend towards lower domestic revenues continues while exports revenue grows. This is in part due to lower expenditures by government combined with an export driven market. The trend here is the norm for the past decade. Domestic vs. Export Revenues: 2014–2017. Credit: Canadian Space Agency. Interestingly the report then discusses what the picture looks like when you exclude broadcasting from the data. Earth Observation (EO) is a market segment that is seeing tremendous growth. However that’s not reflected in Canada as of yet. Canada on the civil side is falling behind other countries in this area. While the government now recognizes the need to do something, a strategy and investments in this area are slow to come. The report provides these key EO data points. Percentage Change of Revenues by Sector of Activity: 2014–2017. Credit: Canadian Space Agency.